Renovations in Amsterdam apartments - nicknamed "halal homes" in the press - have sparked a political row in the Netherlands. About 180 apartments in Amsterdam have been given special makeovers which suit the wishes of Muslim residents. Features include individual taps that can be used for ritual cleansing before prayers and sliding doors to keep men and women apart. Some right-wing politicians have been stirring up public opposition, warning that anyone asking for such modifications should "leave for Mecca". 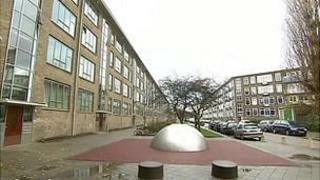 From the outside, the apartments look no different from other social housing blocks in the residential area of Bos and Lommer, in the less opulent western reaches of the capital. Aynur Yildrim gives a tour of her home with the enthusiasm of an inspired estate agent. In the bathroom she bends to reveal the lowered water point - a modification that, in some variation, might equally exist in non-religious homes. But it is the perceived religious aspect of these changes that has made them so controversial. And it is in the tidy kitchen that the distinction is most striking, as Ms Yildrim shows off the sliding doors. "I wanted a closed kitchen, in order to be able to close the kitchen off now and then for a bit more privacy. Sometimes we like to be separated, the women on one side and the men on the other." Wim de Waard of the housing association Eigen Haard insisted that the changes were "absolutely not religiously inspired - they are just practical adaptations". The adaptations followed consultations with local residents, including Muslim groups. Mr de Waard stressed that apartments were not reserved for Muslims - homes were assigned on the basis of rank on the waiting list, size of household and income. For many Dutch people, living in a historically tolerant and liberal country, the idea of separating men and women has led to some criticism that these buildings are effectively condoning some kind of gender inequality. The controversial anti-Islam politician Geert Wilders accused the Dutch authorities of subsidising a "medieval gender apartheid". He has publicly prophesied about an impending "ghettoisation" of Dutch neighbourhoods - not unusually strong words from a man who once appeared in court for his strident rhetoric. Mr Wilders was cleared of inciting religious hatred two years ago. After a poor performance in recent parliamentary elections, Mr Wilders may be angling to woo immigration-conscious right-wing voters again with his strong, headline-grabbing statements. Recent opinion polls suggest that if there were to be an election tomorrow, his Freedom Party (PVV) would win. A Dutch property developer and PVV supporter said he was "shocked" by the "halal homes" concept. "It's a ridiculous idea, I thought it was a joke," he complained. "It turns into reality. The rules of the Koran are discrimination, it is stimulating discrimination. It's taking us back to medieval times." "These immigrants are from lower social classes, they're not educated, they're bringing those values to our Dutch society - the opposite should happen, they should adapt to our modern and free values. We should teach them to integrate. This is backwards. What if it were on buses? If we were to separate men and women on buses it would be like discrimination again, here in the Netherlands. It's crazy. I can't believe it. It frightens me." But many residents in the area seem to accept that what their neighbours do in the privacy of their own homes is entirely up to them. Tess Duijghuisen lives in the same block and said: "A lot of new people arrived here lately, a lot of young people like me, so trust me, there's no problem of ghettoisation. "And there are a lot of exchanges between people from all nationalities, which makes life much nicer here." On internet forums, some users have made light of the renovations, with comments such as, "I believe in the power of disco, please can I have a disco ball built into my apartment?" When I asked Dutch followers on Twitter why the opposition, they told me "it's wrong that inequality should be subsidised by tax money" and that another country's traditions "may be offensive to others". It is a debate over the public versus private spaces. When the public purse is used to part-fund modifications, which many see as the religious antithesis of traditional Dutch society, conflict emerges. Public funding is actually in the form of a guarantee, the housing association says. Yet it is still perceived as a subsidy. The housing association says the complex is completely mixed, that the homes have been renovated to improve their "rentability" and that it is just trying to keep everyone happy. Many would argue that that is a tough ambition to fulfil - whether in religion, politics or our private lives.